The very first Twitter message was sent on March 21, 2006. The microblogging platform was then known as twttr – the vowels came later, after the founders bought the twitter.com domain name. It spent its first few months as an internal messaging system for Odeo, the company that developed it, then was opened to the general public in July 2006. 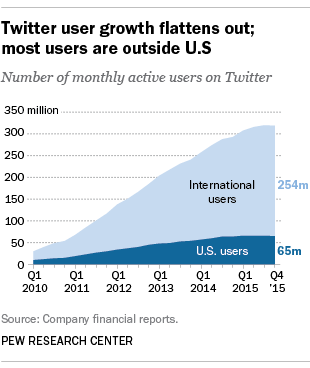 2Twitter is largely a global service. Twitter has nearly four times as many users internationally as in the United States – 254 million versus 65 million, as of the fourth quarter of 2015, according to company filings. However, the company says, Twitter’s penetration generally is higher in the U.S. than in other countries in which it operates. Last year, Pew Research Center estimated that 23% of all adult internet users, and a fifth of the entire adult population, uses Twitter. In the U.S., usage is highest among urban residents, adults under 50 and people in upper-income brackets. 3There are six basic types of Twitter conversations. 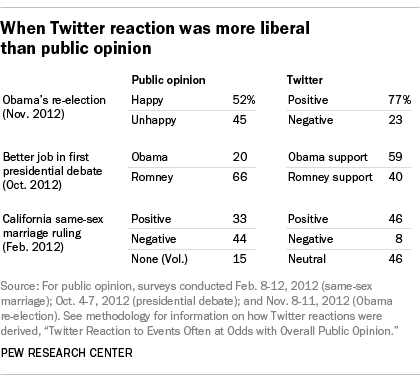 A 2014 report by Pew Research Center that analyzed thousands of conversations on Twitter found that they tended to fall into one of six “archetypes”: Polarized Crowds, where opposed groups talk about the same topic but mostly just to other group members; Tight Crowds, made up of people bound together by some common interest (such as hobbies or professional pursuits); Brand Clusters, large groups that form around particular products, events or celebrities; Community Clusters, multiple small to medium-sized groups that typically form around big news events; Broadcast Networks, where many people follow and retweet a particular news source or commentator but don’t interact much with each other; and Support Networks, usually created when companies, agencies and other organizations respond to customer inquiries and complaints. 5Twitter can be a valuable tool in helping to deal with emergencies. 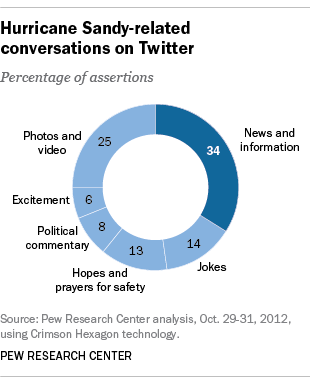 A 2012 Pew Research Center study found that Twitter was a critical lifeline when Hurricane Sandy devastated wide swaths of the East Coast in October of that year. Twitter traffic during Sandy and its aftermath was more than double what it was just before the storm hit; people mainly used Twitter to share news and information as well as photos and videos. BONUS FACT: Despite Twitter’s revenue growth (derived mainly from advertising) and global reach, the company has never turned a profit. Last year, Twitter lost $521 million on revenues of $2.2 billion; it has accumulated losses of nearly $2.1 billion.